Received in good condition, expired date on 2019. It's cheap than other seller.will purchase again. Item received in good condition, not yet try out. Just received. The shipping very fast. Will buy again if it's work on me. hello, may i know it s suitable for breastfeeding mom or x? May I know when expire days . Discount until? Normal price how much? hi! Normal price rm120. 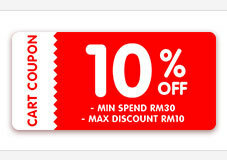 This is qoo10 subsidized program to seller, limited quantity! We not sure when the promotion will end, thanks.